The foursome brought in some big viewer numbers. 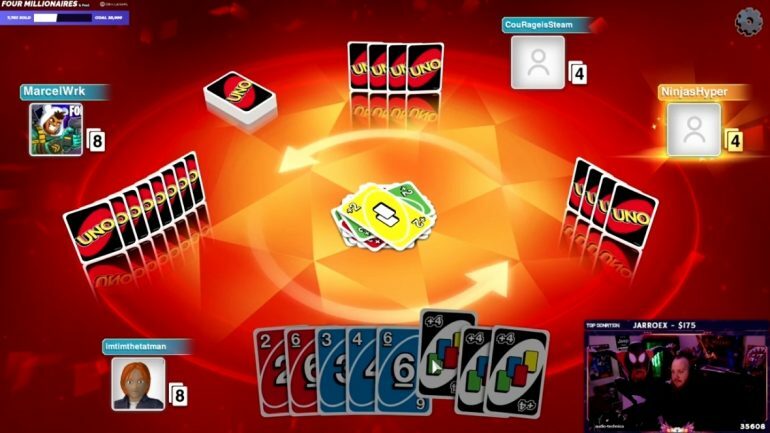 Some of the most popular streamers in the world are wagering subscribers on games of Uno—yes, you read that right. Tyler “Ninja” Blevins, Tim “TimTheTatman” Betar, Jack “CouRage” Dunlop, and Marcel “BasicallyIDoWrk” Cunningham are playing games of Uno on a squad stream, and they’re each wagering 20 gifted subscribers for every game they lose. And although the four streamers are good friends, they’re not averse to flaming each other for making big mistakes in a game of Uno. In fact, Ninja and Marcel screamed at Tim after he inadvertently gave CouRage one of the games and by extension, 60 gifted subscribers. Tim probably wasn’t too hard on himself, however, because he had already won a game, which made the other personalities come to his stream and give some of his viewers subscriptions. This late-night switch to Uno comes a day after Fortnite rolled out one of the most unpopular updates in game history. Ninja and CouRage were some of the most notable critics of the update, which would make sense why they would be playing Uno instead of Fortnite, which their fanbase mostly came originated. They probably won’t stick to Uno as their full-time game, but with the way their viewers reacted to the stream—there was about 100,000 combined viewers—and the state of Fortnite, we could see the group branch out to more games now.